So I love playing with bands. Love, love, love it. Every now and again, a songwriter will come to me with some ideas or even a written chart for a tune. And I play it. No sweat. Where we enter the danger zone is when I come on board as a meta-member of the band. I rehearse. I do a gig or three. They know they want cello-y sound here and there, and after that, it’s anyone’s call. This is perfection. Save cello for another moment. As it stands, the solitary guitar starves the listener between vocals, offering no comfort, just space, and builds anticipation for what he might have to say next. This approach works for everyone, because when you do incorporate the cello, or the accordion, or whatever, it will be special. If you’re like RaRa Riot and write songs with string players as permanent fixtures of your sound, then great. It’s a different expectation, and less prone to busy-making and noodling. I write this because I rehearsed with Ben today in preparation for our show on Friday, and his laid-back inclinations are to have cello all over the place, partly because he’s open to collaboration, and partly because he’s a very easy going guy. After listening to some rough recordings I made of our previous rehearsal, I thought it might be better to sit out a song or two and scale back some of my wafflings on the other tunes. Of course he agreed: he is as agreeable as they come. I’m just hoping that these choices give his amazing songs the space they deserve, and that what I contribute sits in the song rather than on top of it. 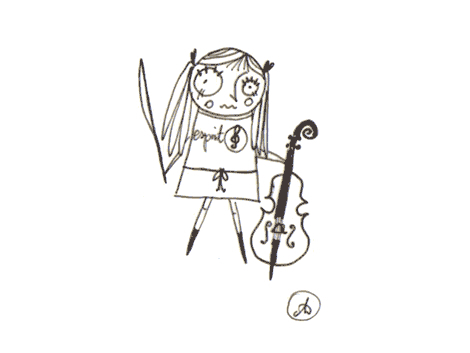 PS: Cool cello girl illustration from TheGoodMoodFactory. I like just about everything she does. I see what you mean about letting the guitar speak for itself but I’d like a little cello to break the sameness. I really like the song. An important lesson that took me a long time to learn!! Good luck w/ the show friday! As I’m sure all of us who’ve come from a classical upbringing and later made forays into rock/pop/fusion cello-ing have found, there are both refreshing and frustrating aspects of playing/recording with bands. Given your high expectations of yourself and others, Emily, sometimes I wonder how you deal with the frustrating aspects of participating in the pop scene. I’m a cellist, but I’ve learned enough violin/viola to be able to write and record full string arrangements for local studios (I have some home recording gear that allows me to take the requisite time to scratch out acceptable vln/vla parts, then transfer the files to the studio computer). The thing I’m struggling with lately is this: I’ll do these string arrangements for bands, and then when they play live around town, they’ll ask me to play cello with them. And I’ll ask if they’re going to pop for a string quartet or trio (because that’s what’s on their recording), and -unsurprisingly- I’ll get “No, why don’t you just play.” Well, okay, but as mighty as the cello is, it’s not really going to sound like your full-on string arrangement(s) on the record. Even better: when I sound check and get a lovely sound through the amp/pre and then people in the audience use words like “tinny” or “trebly” to describe my sound. Bah! Nicely put. “Just because we can” is not always the right answer. 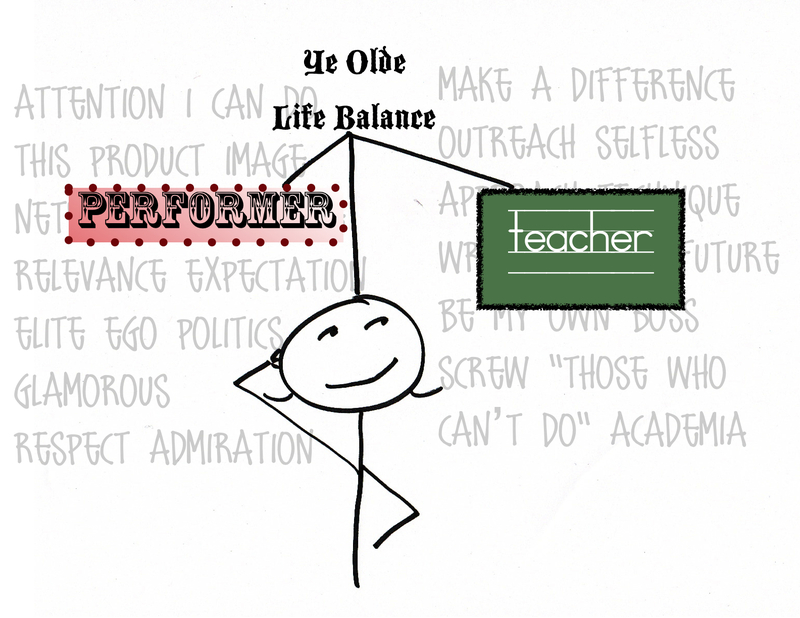 Long live your critical yet thoughtful ear of a true collaborator. PDR, as a fellow cellist who often plays with pop bands, I think the incompetent sound engineer issue is one of the reasons bands often include just cello in the live sets. (another reason would be space on stage.) Why hire three musicians who won’t be heard over drums and guitars when you can hire just one (who also can’t be heard, but at least looks cool, amirite?)? Plus, cello has more of its own register in a rock band, between bass and guitars, while higher strings fight with guitars and higher vocals, so there’s slightly more hope for us. Erica– agreed on the space and money issues, for sure. Hearing your views on the register issue is kind of fascinating; I was always of the opinion that it’s the cello is actually fighting for register/frequency space (vs. guitars, bass, male vocals) in a band. I see a violinist on stage and think, ‘Sonically, they have it much easier because their range is situated at the higher register of the guitar.’ [i.e. easily heard, cuts through] Oh, and they can stand/move around stage, which would be fun. [Yeah, I know, keyboardists and drummers sit, too, and some enterprising pop cellists do stand…] Anyway. Thanks for the glimmer of hope! PS Not that anyone asked, but it’s fun to swap gear recommendations. For low/moderate-volume gigs I’ve had great luck with a little clip-on mic (Audio Technica ATM350). Note: requires phantom power. I clip it to my fine tuners, but there’s also a velcro strap with which you can lash it to the strings. For crash/boom/bang band stuff I use the Gage Realist pickup with a LR Baggs Paracoustic DI box. Emily, Erica and others– would love to hear what you use for live gigs. I have yet to hear you play but however you play, this post has given me a very different and very sincere appreciation for your thoughts (in addition to our moves on the dancefloor).